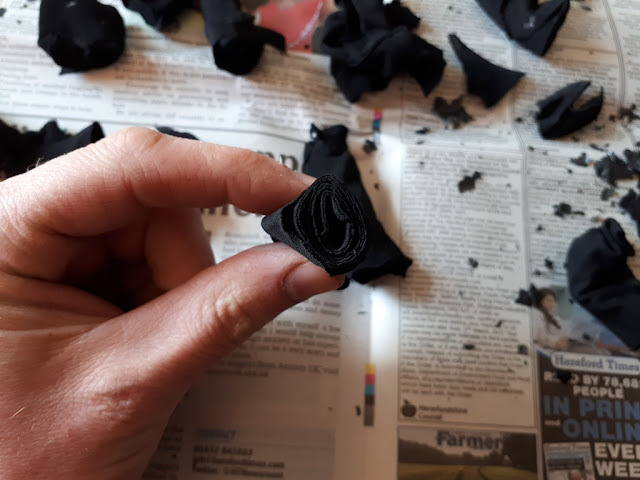 Just lately my eldest daughter has shown a bit of interest in bush craft, this is a subject I love so I'm only too keen to show her all I know! We've done a bit lately together with shelter building in the snow and other little bits and pieces, but she has asked about making fires, with rubbing sticks together and by using sparks. So Yesterday I went for a short walk on my own, I grabbed some dry hay and straw as tinder and set off to find a sheltered spot. 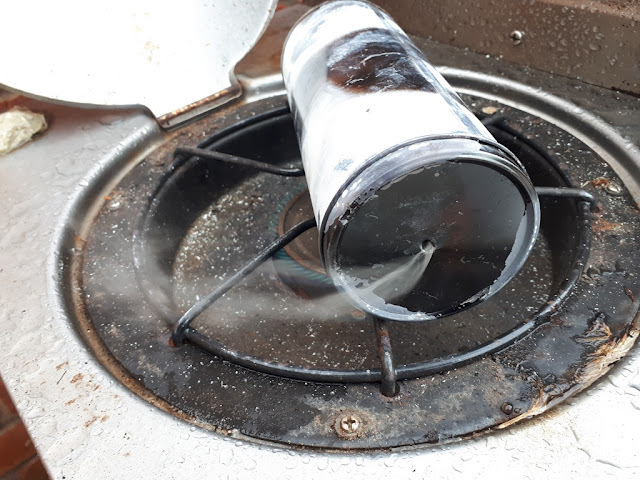 I made a nest with my tinder and started to make sparks with my ferro rod, nothing was taking, I needed some cotton or something finer to take the spark, good job my daughter wasn't there to see how unprepared I was! 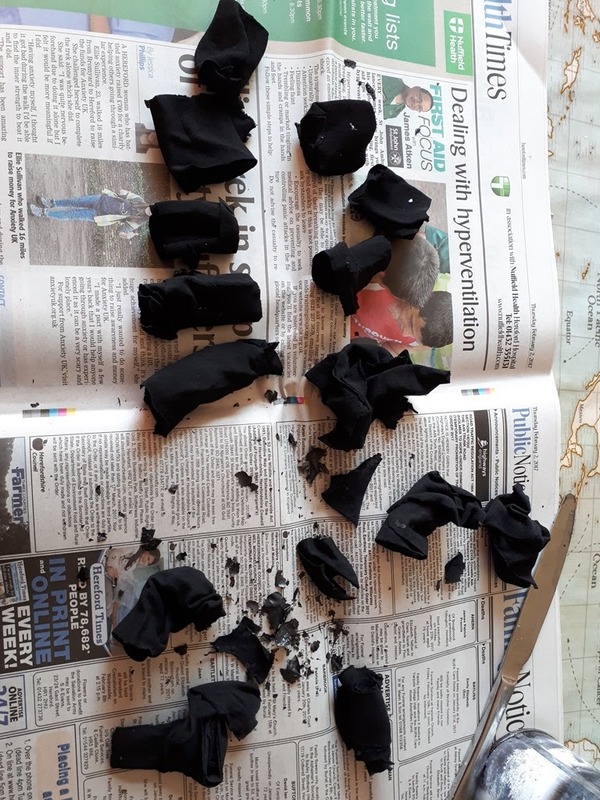 So today I set about making some char cloth to make fire lighting a bit easier. 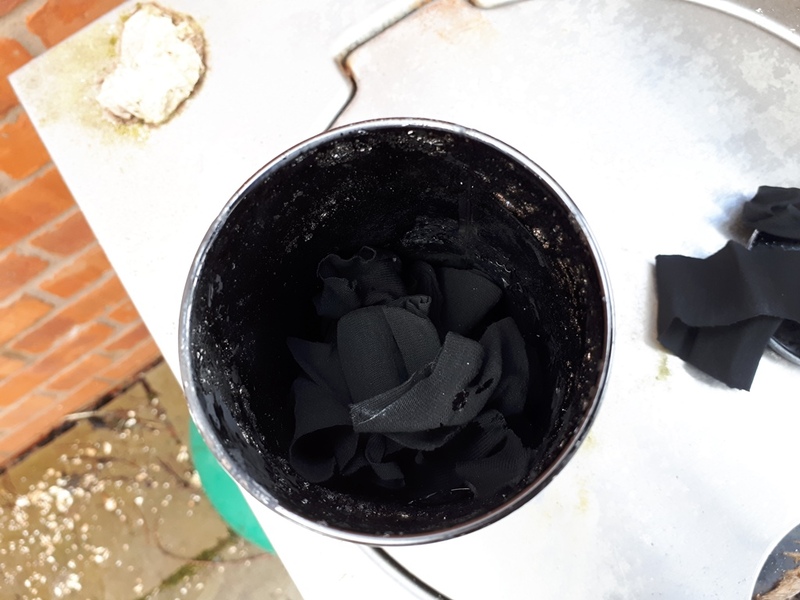 Char cloth is fabric that has been burnt without oxygen and can be used for tinder, it is made using the same method as turning wood into charcoal. Below is the step by step as to how I did it. 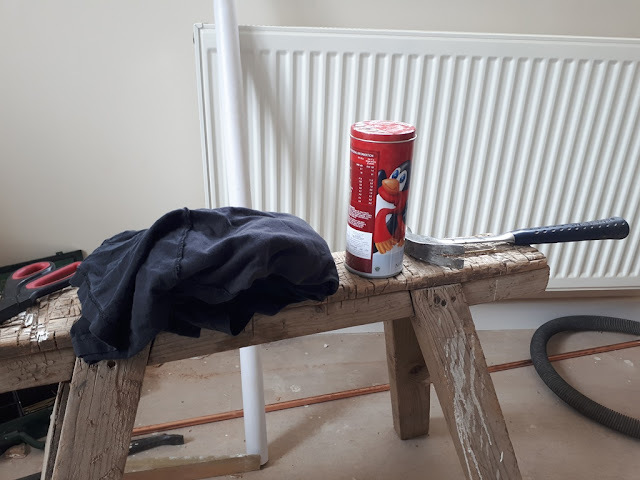 The materials I needed, an old T shirt, a biscuit tin, a hammer and a screw. 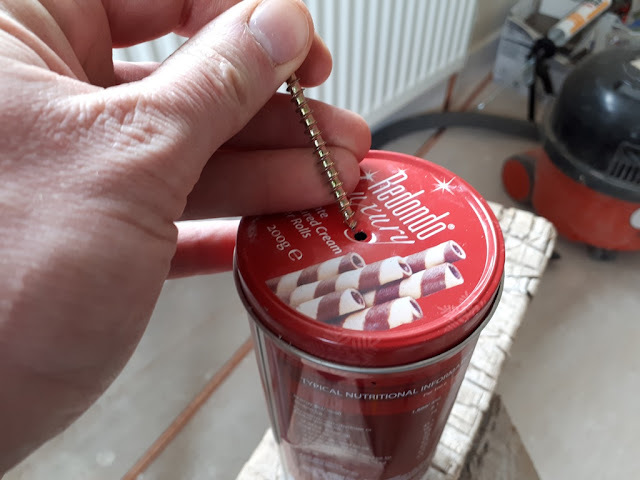 I knocked a hole in the top of the tin. 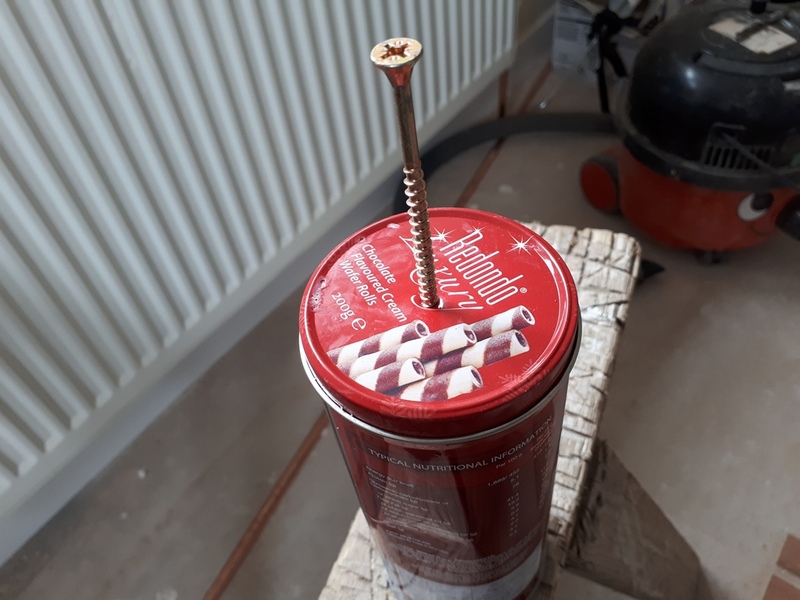 Not always essential depending on what tin you're using. This one seals shut so might pop open if I didn't. I'll keep the screw so I can block the hole up later on. I rolled the shirt up and cut it into strips. The tin is packed quite full with this. 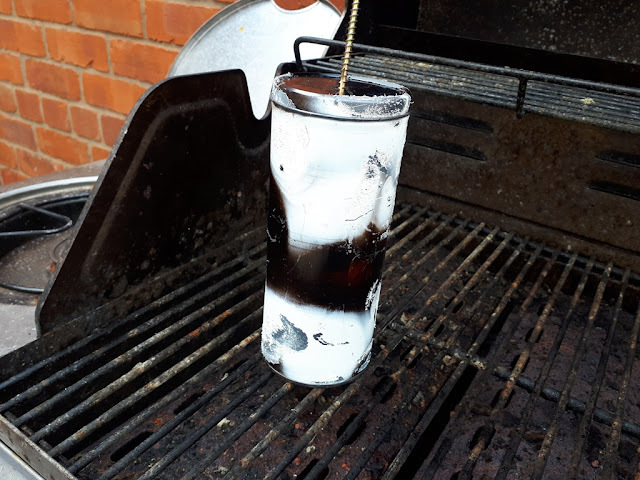 I then put it on the gas BBQ outside. A fire would be more practical if I had one going, but the gas ring works fine. the painted penguins didn't last long. The smoke pours out the hole, it does ignite sometimes but this is the gases being cooked off. When the smoke stops coming out of the hole I then take it off the heat and block the hole to prevent it reigniting. When the tin has cooled completely, you can take the lid off and see if you've been successful. Make sure it's completely cold or it could reignite! I was quite pleased with my burn as it all seemed to turn into char cloth. 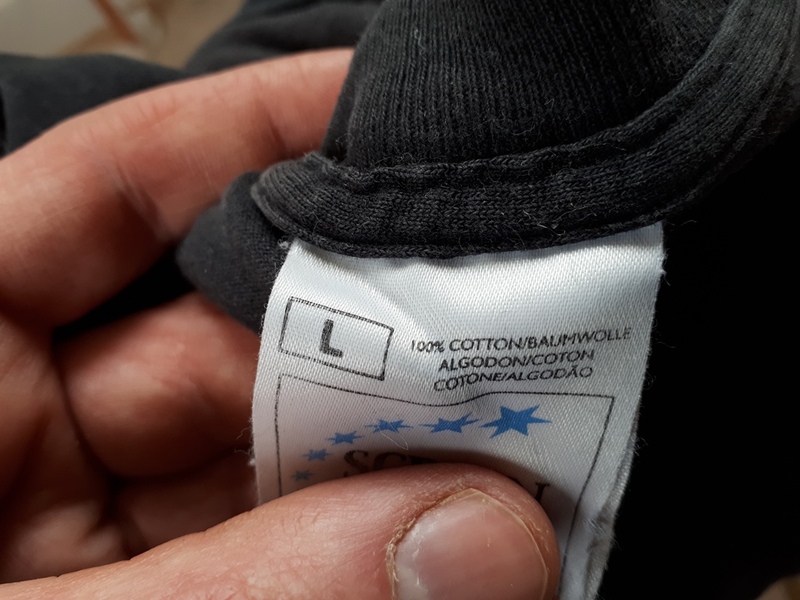 It's easy to tell if it has been successful as the cloth feels really light weight and fragile, it tares easily as well. 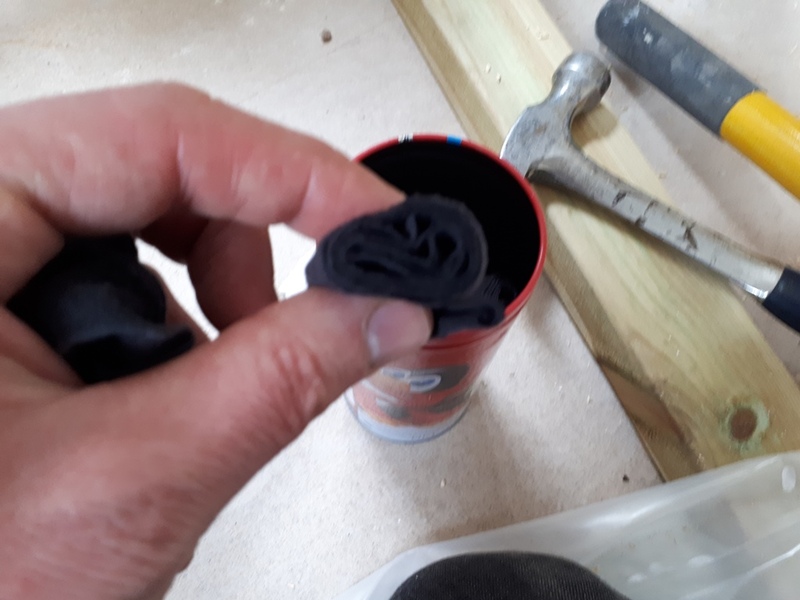 Rolls of char cloth like this are great for taking a spark and burn for a good while. This is a piece of cloth after receiving one strike of my ferro rod and steel. The char cloth takes a spark so easily, but it won't flare up. Once it's taken a spark it needs to be transferred to your tinder to make a fire. 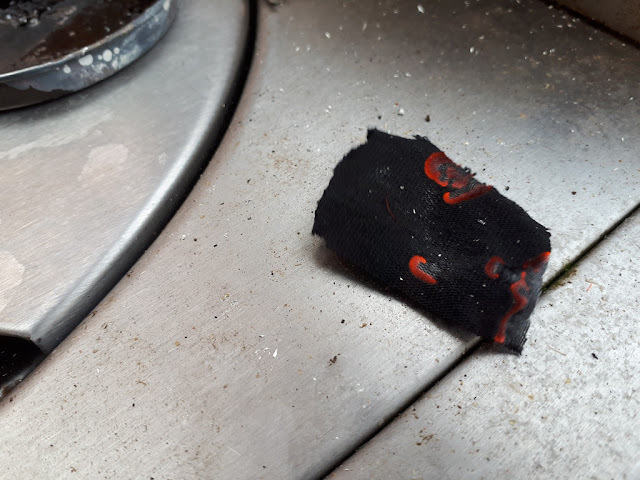 Char cloth is also great if you're trying to start a fire with a flint and steel as well, you only need a tiny square of cloth sat on your flint if you have your tinder set up ready. Tonight we took it outside and I showed the girls how quickly it caught a spark and then got them to blow into the tinder bundle to get it to catch. They loved seeing it go up in flames. So next I need to make up a fire bow set to show them how to make fire by rubbing sticks together! It's been nearly ten years since I did this last so I'll have to see how much I remember! How fun. I would love to learn to start fires with a flint but it's a skill I would need to learn from someone in person. Have also read that in a survival situation the tiny bits of lint that collect in the bottoms of pockets will take a spark well. I'm already planning on making char cloth, except that the smoke alarm in my tiny kitchen goes off when I'm making a normal meal. As you said, I need an outside grill. The likelihood I would actually need the char cloth is pretty slim, but I love to know about it. My only experience with fire starting has been on car-camping trips to the Oregon coast, which presents some challenges with damp wood, the need to scare up some little bits of wood for tinder, and the sad realization that some crumpled up newspaper had better be there for the matches to ignite. Even then, having a person along on the trip who actually knows how to start a fire is a big help. There is an art to it. Looking forward to the fire bow post. Brilliant idea. I'm going to try it. 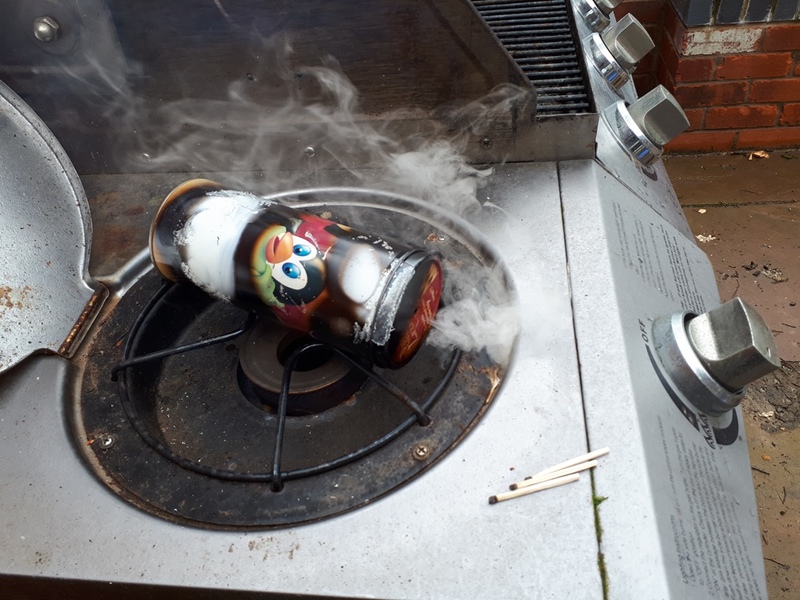 Me son's friend made a 'fire can" (for lack of a better term. You take the cardboard roll out of a toilet paper roll. Put the paper roll in a can around the same size so its a tight fit. Pour rubbing alcohol in the can and cover it with a lid. Rubber band a couple of pieces of flint to the side of the can as your igniter. When the powers out you could use the can as a source of light and heat. I have the old syrup tin, old tea towel, fire and son, I just need to remember to put all of them together at the same time and make some! bullrush heads just as they ripen but don’t quote me on it!